Praise the Lord because since the first century the early church responded quickly against the false doctrines with the creation of creeds and statements of faith. Praise the Lord for the bravery and passion of thousands of believers throughout history that have willingly died for their faith and the purity of the word of God. The word "martyr" comes from the Greek word martyrs, which means "witness" or "testimony“. So please pray for us and all the missionaries in the word, so nobody gets distracted or passive about witnessing Christ. Please pray for joyful and brave witnessing with a sense of urgency and love for God (1 Corinthians 2:2). Our church is still celebrating the 500th anniversary of the reform. As part of our celebration, our children studied about Luther, the real Gospel and ended making a play between Luther and the Catholic Pope. Also I started a two months weekly class about the history of the church for new believers and brothers who are preparing for baptism. Praise the Lord for all the good fruit that is coming from the classes understanding our Christian history. Some of the participants are using the classes to teach their own children, others are discussing the importance of the statements of faith and solidifying their historical and documented understanding of our faith. I am finishing the classes in Spanish, and please pray for the church and me as I prepare to teach them in English in May and in Japanese in July. Praise the Lord for our Resurrection Day outreach event. 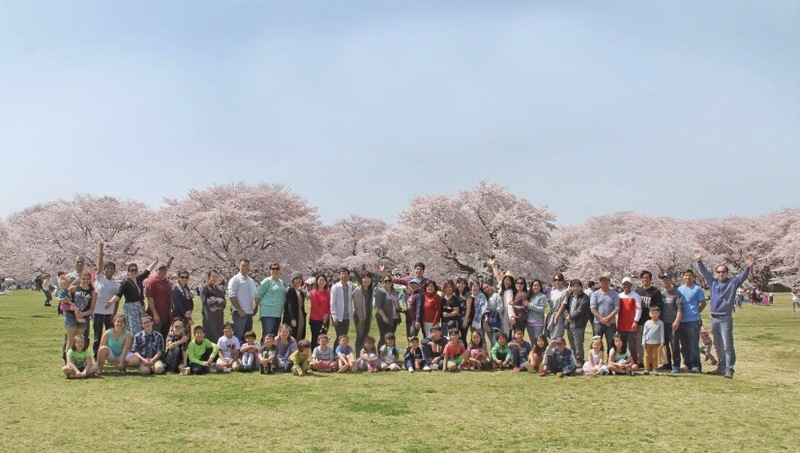 We celebrated our service at the Tachikawa Park, our Lord blessed us bringing many guests from Peru, Japan and America to share the Gospel with. We gave hundreds of Gospel tracts in Japanese and I could pray in Japanese with a person in need. This is a season in Japan were all the streets are full of adults and children carrying idols in shinto processions, but praise the name of the Lord that we also have the freedom to sing and testify about our Lord at the same time. Praise the Lord for our new believers who are preparing for baptisms next month. We have been studying the marks of a healthy church, church ordinances, history of the Anabaptists and the Gospel. Please pray praising God for the gift of salvation, the blessing of the ordinances and our new believers to grow conforming to the image of Christ. Every year we have two church retreats in which we study the Bible as a church in the mornings and also in the evenings. This Spring retreat theme will be about Heaven and Hell. We also have two children bible studies about the beauty of the Gospel. Founding our retreats in God’s word accompanied also with rest, relaxation, sports and fellowship has been one of our greatest blessings in bringing unity and joy to our multicultural and multilingual church. Please pray so this retreat will also encourage us to be more like Christ with a heart of unity, thanksgiving and fervent in the spirit (Romans 12:11). We will be celebrating at the end of May our 9th church anniversary service next to the river. Please praise the Lord because every year on our anniversary he reminds us that we do not deserve anything, our salvation, our church and our hope of eternal life is just because His mercy and grace. This anniversary is a great day also because we take a time to share and remember all blessings and miracles that our Lord has done through the years in our lives, families and church. Please pray also because we will have the privilege of having 2 baptisms in this land. It is a huge miracle in Japan, a country in spiritual chaos, darkness and where just less than 0.5% of people profess Christian faith. Praise the Lord because His mercy looks beyond this materialistic society, technology and tall buildings, and sees the great need while bringing salvation. Praise the Lord because he sees what tourists cannot see, the disaster, chaos and death that a historically God rejecting country breaths. He has not forgotten Japan, He is such a might savior. Please pray praising His name not because of the missionaries in this land, but because of the beauty and power of the Gospel he is entrusting us with as a privilege and a joy. There is no one like our God. Please pray for our families in Peru and England. Some of them are believers and others are still rejecting Christ. Lately, we are receiving some bad reports about their health as they age. We would appreciate prayers for their salvation, health and wisdom for us. Thank you brothers and sisters for always for holding the rope through your prayers and support.